It was announced on Thursday by everyone's favorite friend Tom that Myspace Mobile ( mobile.myspace.com) is "officially available. Posted as a Myspace Announcement, Tom let the world know that Myspace Mobile was "good on the go". The mobile site is a much slimmed down WAP version of the popular social networking site. Myspace Mobile allows users to easily view their profiles as well as others, check their mail & blog, find users and read comments. The site is well laid out to make navigating easy on nearly every device, with numbers assigned to each menu item for quick jumps from one to the next. A welcome relief for addicts that just cant seem to get enough. Myspace Mobile can be accessed via any mobile browser by visiting mobile.myspace.com. Myspace also finally came to terms with Sprint and offers instant SMS alerts for comments, mail etc. to all the carrier's customers. Formerly only those on Cingular and Helio customers had the premium feature available. 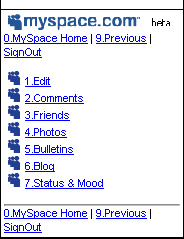 Also for those few Sidekick users - a special Myspace app has been released to help cope with your addictions. An updated version of JiveTalk, the popular instant messenging app for BlackBerry smartphones, released an updated version this week. The already awesome app now offers MySpace Instant Messaging support! Click here for more details.